Run or walk for 6, 12, 24, or 48-hours in Vermont this fall! New this year - USATF Certified Marathon distance & 50K options including the QUADZILLA!! Loads of upgrades for '19! 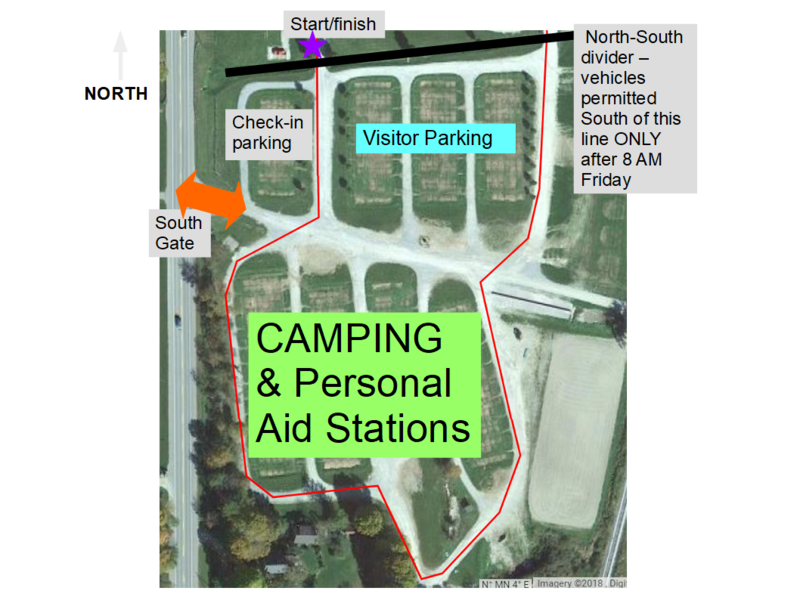 From Aid Station, food, and course improvements to Thursday camping!!! More info to come, stay tuned!!! This fall foliage race is held at the Harold Beebe Farm in East Dorset, Vermont. Nestled in the narrow valley between the Green Mountains and the Taconic Range, Beebe Farm enjoys spectacular scenery, especially during early leaf season! The course is comprised of packed dirt and limestone. The surface is very foot-friendly, with first year runners reporting almost zero foot or related issues. Soft enough without being squishy, the track boasts almost no small stones and is smooth enough for even the most aggressive shuffler. Racing surface is a minimum of 8' wide at the east bridge, and a whopping 18'+ along most of the loop!! Located on a closed and fully private facility, runners will enjoy a clear and unobstructed track. No 180-degree turns or big climbs. The course is not fully lit, so bring a headlamp! There will be both active and reflective light markings (*new this year!) to help you run the tangents all night long like Lionel Richie. Plenty of course-adjacent room for cars and camping! We mean it, tons of room. We absolutely won't run out of choice spots. No RV hookups or dumping on-site, however RV's are allowed (no length restriction.) All RV's longer than 20 feet must check-in no later than Friday and must remain on-premises until 9AM Sunday. No hookups = no fee! Portables in multiple locations along the loop, including ADA units. All portables will be wash basin equipped. The average high temperature on race day is 64°F, average low 39°F. Be prepared for anything - but we anticipate cooler weather. NO PUMPKIN SPICE!! You will find a large aid station directly in front of the start/finish barn. We will provide hot and cold food and drinks throughout the day and night. Hammer gels, Heed, and Perpetuem will be available at all times. Most standard aid station snacks, plus a rotating menu of hot food and Vermont specialty items -- local farm fresh organic produce, cider and donuts, fresh locally-made breads and cheeses, and a variety of seasonal hot foods will be stocked. Plenty of vegetarian and vegan options. Do you have special dietary needs or requests? Please let us know when you sign up! Last year we didn't do a good enough job letting racers know what we had and ended up with tons of GF and Vegan leftovers! We can't promise we'll have everything, and if there's anything you absolutely need you should bring it yourself, but we will do our best to accommodate everyone. This is a cupless race! We mean it. For real, guys. Please help us keep things green by bringing your own bottle or cup. We will have designated space for your bottles next to the aid station. Hot drinks provided in the overnight hours, so consider bringing a thermos/tumbler/mug/etc. Runners will find a custom Beebe Farm mug/spoon combo in their swag bags! At 12oz, it's just big enough for a lap! Limited space and cots will be available for 24/48 RACERS ONLY!!! Sorry, the fun is reserved for those of you who are truly crazy. We ask that you limit visits to 2-hours maximum to accommodate others. Bring a blanket and pillow if you can. WE STRONGLY SUGGEST SLEEP MASKS AND EARPLUGS!!! The tent is a quiet zone, however, some of you guys snore!! (no judgement) The heater is also just a tiiiiny bit noisy. This race will be chip timed by Mike Melton of MCM Timing! You will need to wear your bib at all times for your laps to be recorded! Multiple digital lap readouts and timing clocks will be available. Live tracking links to be posted before the race! There will be a redundant timing mat on the back section of the course. Custom, locally made awards for the top 3 female and male finishers in each distance. They're made of stone and they're millions of years old, so they should last pretty well.